This week is spring break for us. That doesn't mean much besides the fact that I declared there would be no school so that we could get to work on some projects around here and hopefully whip the place into shape. Every so often I begin to feel like we're drowning under all of our "stuff," so then we have to take some time to dig out and reorganize. We are actually coming pretty close to living in this house as long as the last house which set a record at 2 years and 8 months. That means we are starting to feel the itch for something new. That translates into Justin ripping up carpets, and me dreaming of all the things we could do with very little expense. Since we actually own this house, there are so many more options, and I've been thinking about lots of wonderful things. I have so many ideas for most every room in our home, but since I spend a lot of time in the kitchen, it seems to creep toward the top of my wish list. I've always been thinking of ways to improve it, but it was really seeing Layla's latest work in her kitchen over at The Lettered Cottage that really has me wanting to get to work. Her kitchen was gorgeous before, but these colors are just what I was looking for. I really like the look of white on top and another color on the bottom, but I just couldn't land on what color would be appropriate. I think these colors would make a wonderful backdrop for my scarlet and peacock fiesta ware. 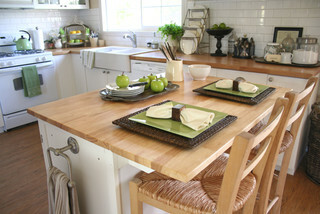 I'm also dreaming of butcher block counter tops like these. I've heard that you can get them for a very reasonable price at IKEA, so I might have to add that to my wish list for the next time I find myself in Charlotte. I've been reluctant to start painting anything in this house because I know it will bug me that the trim throughout the house is off white, and I'll be painting it white as we go. That means it won't all match. GASP! But I guess one step at a time is better than nothing. For now I'll settle for the projects that are more "need to" rather than "want to," but you can bet I'll continue dreaming! I love that kitchen in the first picture! 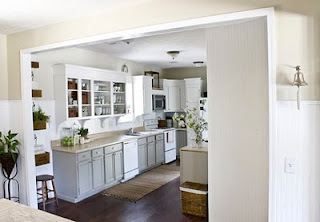 I am hoping to repaint our kitchen in the near future, but I am a bit wary of how it will turn out. I have enjoyed your homeschooling posts a lot. We are also a homeschooling family. I have one (kindergarten) actually in school, a three year old, and a baby due in the summer. My husband is also a pastor.